This lovely yarn from Juniper Moon Farm that I purchased last week at the Knot Just Knits closeout sale was begging to be knit up. It was purchased with the intent of knitting something for the Women’s Heart Association annual fundraiser that my SnB group has been knitting for the past couple of years. Last year I did not contribute, so thought that I should start early this year. I chose to reknit the Greta Garbo shawl by Nancy Bush. A couple of years ago I knit this and gave it to my sister Diane. Since the Juniper yarn is a much finer gauge than I knit this with, I chose to add an additional repeat and use a smaller needle. At first I just cast on an extra set of stitches to repeat the large motif on each side. 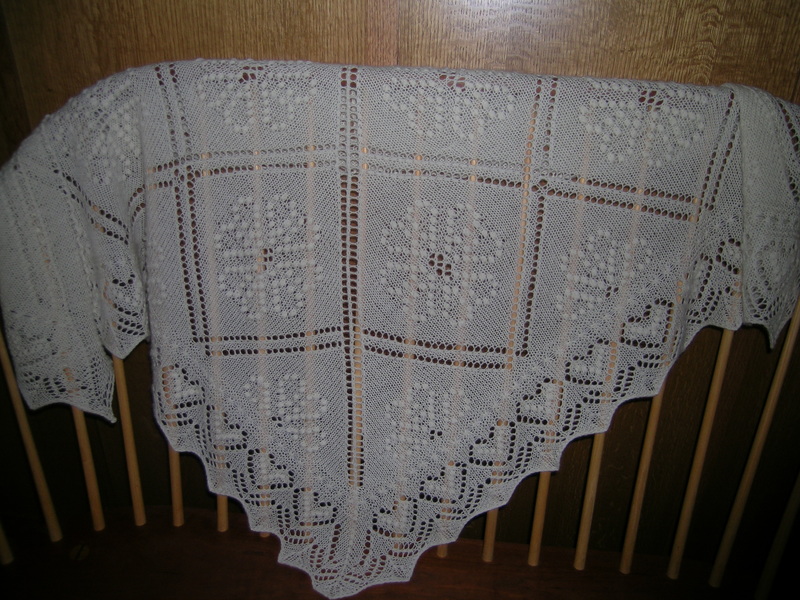 This shawl is started at the bottom right and left edges, so this meant casting on 475 stitches. After knitting the first row, I realized that there was a problem with my methodology. The border repeat is a multiple of 14, and the large center motif is a multiple of 48. Didn’t work out, so I kinked back 475 stitches, as I really did not want to cast on all over. 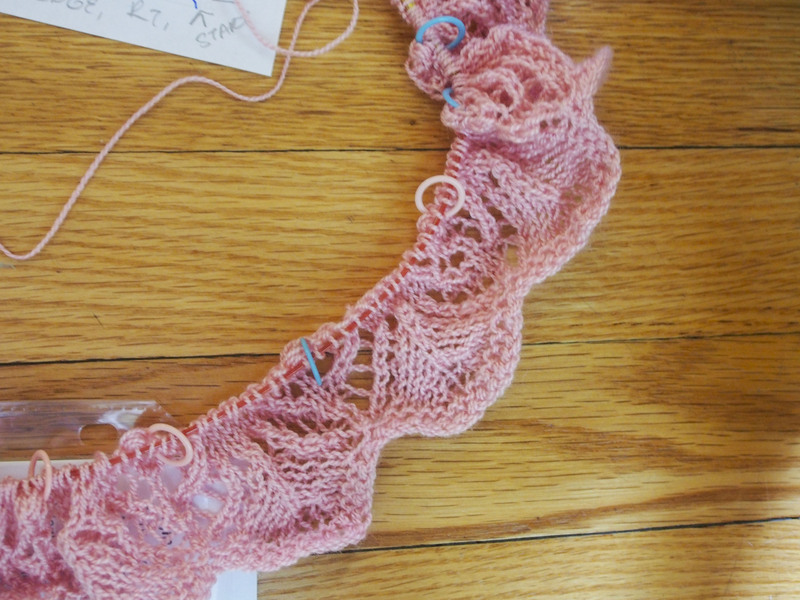 Then I had to redraft how the bottom portion would knit up at the beginning and the center. This yarn is so soft and lovely, 50% merino & 50% silk. However, it is also a bit tedious to work with given this pattern, and I am nervous about the yarn slipping off the needles. I am also hoping that the nupps will show prominently enough. 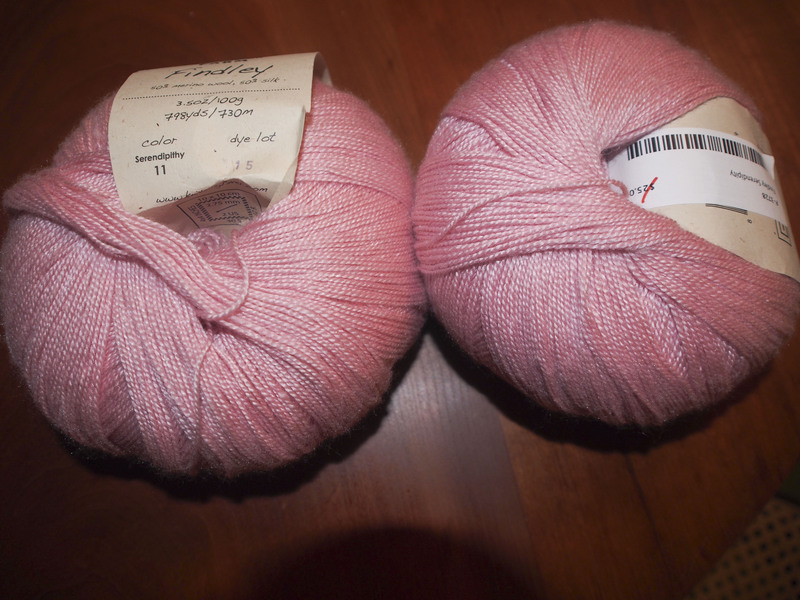 Currently they are a 5 stitch nupp, but I am considering switching to a 7 stitch nupp for the main part of the shawl. 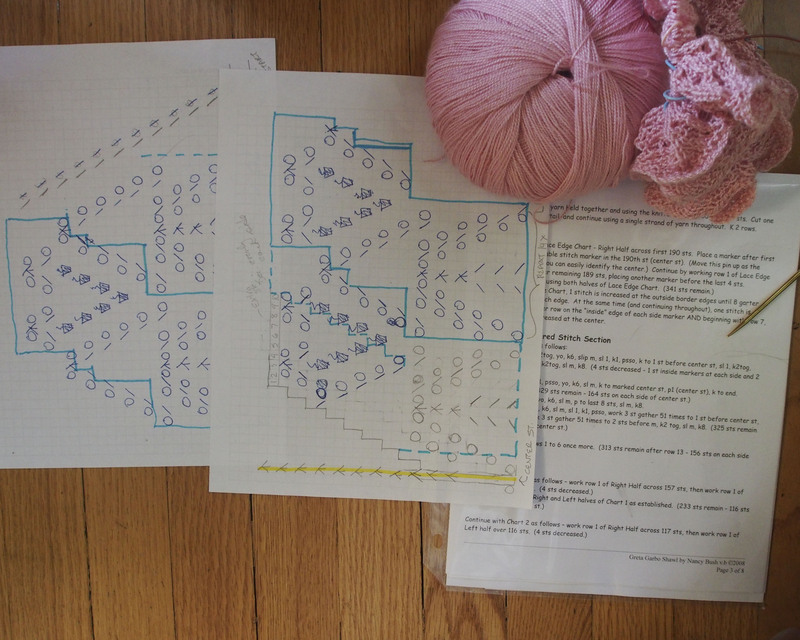 And, then again, I may knit something much simpler for the main part, I will see how the border goes, and how it looks. This shawl will not be traveling with me, nor going to knitting group until it is finished. I have it setting next to my comfy rocker in the living room, and there it will stay while I work on it slowly. Currently it takes about 20 minutes to do a row, but 4 stitches are decreased every other row, so it incrementally gets faster. 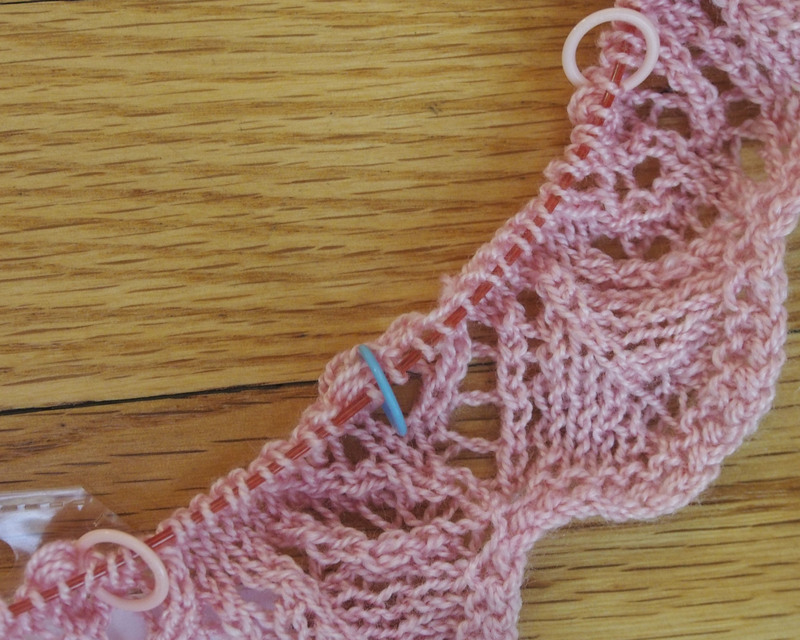 I have been tearing my knitting stuff apart looking for the point protectors so that I can make sure that nothing slips off when I am not working on it. May have to buy some new ones. So, will this be an epic feat, or an epic failure? I know that I will use life lines on this one! I love my shawl! Thank you so much!